As we're moving into the end of the year, we're looking back on sites we've completed, and there are a number we still want to announce here on the blog. 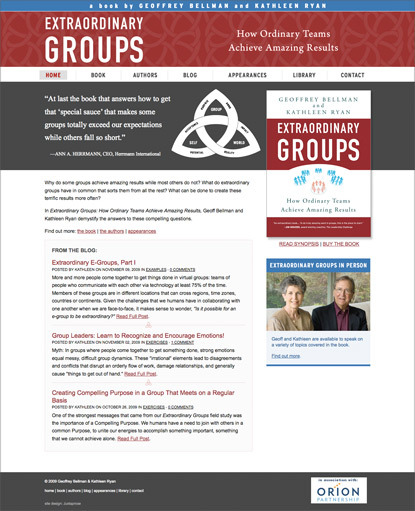 One is the Extraordinary Groups website, which we launched back in September. This project has been nice for us in a number of ways. One is that the authors are local to Seattle, so we've been able to have some face-to-face meetings. We work remotely so often (which we enjoy, and find that it works well for us and our clients), but it's great to meet people we work with in person when possible. Meanwhile, we've been working on another site for Kathleen and her partner Bud for their consulting business, the Orion Partnership, which we'll be announcing here soon. For the Extraordinary Groups site, we based on the design on the bookcover, while using elements from their groups model (a Celtic knot) which is used throughout the book and in their presentations. Both the Extraordinary Groups site and the Orion Partnership site are built in ExpressionEngine, and we set them up with a multiple site manager, so they can easily manage the content for both sites through one interface / login. (We'll write about some of the neat things we're doing with shared content when we post about the Orion Partnership site.) We did some one-on-one training yesterday, and are looking forward to seeing how the sites grow. For now, look for updates in the blog for regular examples and exercises that supplement the book.